I was out walking this morning after the kids had left for school with the mighty Boo-Dog when he started barking like a lunatic. As I’ve mentioned in previous posts, Boo has some issues so his barking could have been caused by anything from a serial killer hiding in the bushes to a fly buzzing by him. It’s all the same to him. I allowed him to lead the way along the trail so he could show me what was upsetting him so much. I really hoped it wasn’t the serial killer. Instead we met a lovely lady who was digging a hole to lay her eggs. She seemed pretty focused on her task so we didn’t stay too long. Just long enough for Boo to realize she wasn’t going to kill us in our sleep and that it was ok for her to be digging a hole. She is an Ontario Snapping Turtle but she didn’t snap at us today. I kept Boo out of snapping distance. 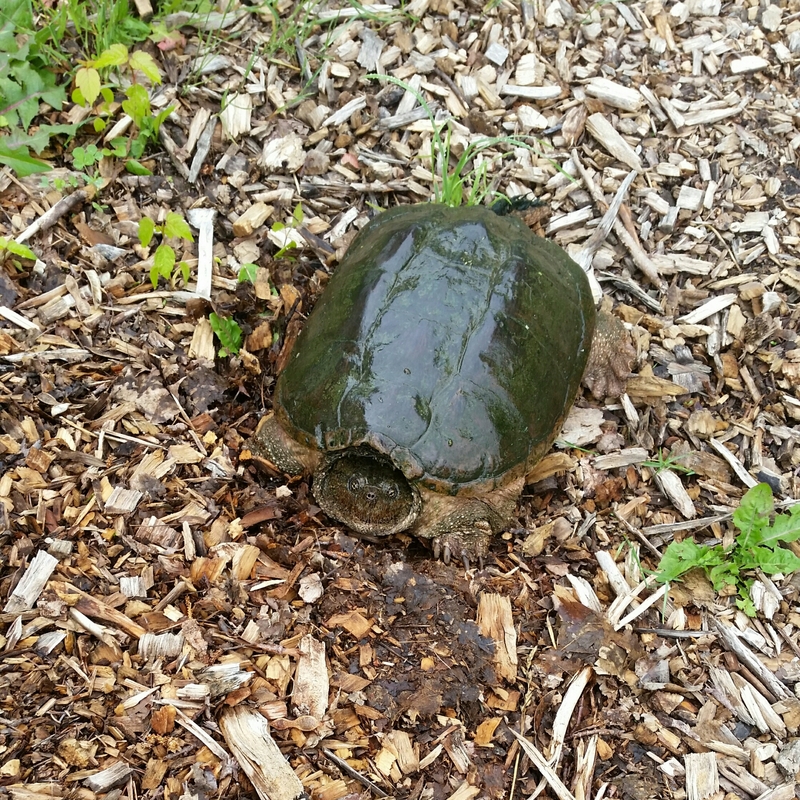 Snapping turtles don’t lay eggs until they are between 17-19 years of age and then lay between 40-50 eggs per year. They can live up to 70 years. That’s a lot of babies.